Seville (Spain) – April 9, 2019 (travelindex.com) – The world of tourism has just witnessed the 2019 WTTC Summit (World Travel & Tourism Council), the largest gathering of the tourism industry’s private sector trade in the presence of so many Government Leaders including Barack Obama, the former President of the USA and Margaret Kenyatta, the first Lady of Kenya amongst so many Tourism Ministers coming from the four corners of the world. This year, it was Seville in Spain, who had the honour of hosting this tourism gathering. Mario Hardy, the CEO of PATA (Pacific & Asian Tourism Association) was also present showing unity in the private sector tourism trade. It is important to congratulate Gloria Guevara Munzo, President & CEO of WTTC and her Team for staging another a very successful Summit. I was invited to attend as a delegate and represented for the first time, my Saint Ange Consultancy / Tourism Report. Travelindex Media has confirmed that a record number of delegates were in Seville for this year’s WTTC Summit listening to presentations from fellow top leaders of the largest industry in the world which included a talk with Barack Obama, the former President of the USA. CEO’s, delegates and ministers that attended the 2-day event last week and everyone said the networking opportunities at WTTC summits was the real value for them to attend such a high profile event. “See and to be seen is the true perk here” the delegates said. At the WTTC Summit Top travel – industry people meet with other top CEO’s in the hallways and coffee shops or hotel suites. Some delegates only attended the opening ceremony and the Obama session but were roaming to shake hands with business partners, ministers and even heads of state. Big business is done this way. It starts often with an exchange of ideas and can trickle down to billion-dollar transactions. The WTTC summit is also the place a CEO can have a cup of coffee with a fellow CEO from a competing company. “Former Seychelles Minister of Tourism, Civil Aviation, Ports and Marine of Seychelles Alain St. Ange, who now leads his own consulting company, met with Kenya Tourism Minister Najib Balala consolidating the working cooperation between the two tourism personalities. St.Ange and Balala have been friends for a number of years and both men are seen as continent leaders in the field of tourism. St.Ange said: “Minister Najib Balala of Kenya and I are expected to meet again in Nairobi shortly to discuss tourism and the development of tourism in Africa. This is a typical opportunity only such a Summit offers. WTTC is a different type of event. Change-makers meet behind the facade of top-notch presentations. Attending is a priceless opportunity” eTurboNews reported in their article on this year’s WTTC Summit in Seville. I was honoured to have met many tourism personalities during my two days in Seville and touched base with many old friends. The Travelindex Founder Bernard Metzger, one such dear friend who made time to meet with me at WTTC Summit in Seville Spain, and together we discussed tourism and trends. He has in his portfolio Tourism & Travel Foundation, Tourismpedia (World’s Open Tourism Encyclopedia) and Top 25 Restaurants, the World’s First Restaurant Guide based on AI. I also had an interesting meeting with Maitha Saif Majid Al-Mahrouqi, Minister of Tourism of Oman. We had already met in Seychelles when the Minister was on a fact-finding working mission when I was still in Office. A follow-up meeting is being planned to take place in Oman. The meeting with my old dear friend Gerard Lefebvre of Cleverdis, the producers of tourism trade fair daily magazines was enriching as usual as was the catch up with Geoffrey Lipman of the SUNx Program and ICTP. The countries and leaders who have made a difference to increase the competitiveness of the Travel & Tourism sector within their countries have been recognized at the World Travel & Tourism Council (WTTC) Global Champions Awards at the WTTC Global Summit in Seville this week. The inaugural WTTC Global Champions Awards recognizes those countries from 185 around the world which have used policy initiatives to create the conditions to promote the long-term sustainable growth of our sector. Security & Seamless Travel Experience which recognizes leadership in transforming border security and the traveler experience through the use of technology and facial recognition systems – awarded to Kevin McAleenan, Commissioner, Customs and Border Protection, USA. Resilience which recognizes leadership by a country which has demonstrated success in recovery from adverse events – H.E. Dr. Rania Al-Mashat, Minister of Tourism, Arab Republic of Egypt. Social Impact which recognizes leadership in enabling gender equality and diversity; engaging local communities and making the sector more attractive for future generations – awarded to Hon. Najib Balala, Cabinet Secretary for Tourism & Wildlife in the Government of Kenya. Destination Stewardship which recognizes leadership for work undertaken to overcome seasonality as a way of improving the year-round tourism experience – H.E. Elena Kountoura, Minister of Tourism, Government of Greece. Crisis Preparedness, Management & Recovery which recognizes leadership in disaster preparedness and having effective response systems at both national and local levels – H.E. Keiichi Ishii, Minister of Land, Infrastructure, Transport and Tourism, Government of Japan. Innovation and Technology recognizes leadership in innovation and the implementation of technology that meets the needs of tomorrow’s travelers and fosters sustainable tourism growth – awarded to H.E. Maria Reyes Maroto Illera, Minister of Tourism, Government of Spain. 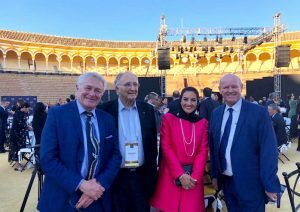 The awards ceremony took place at the Gala Dinner of the WTTC Global Summit which was held in Seville, Spain, and hosted by Ayuntamiento of Seville, Turismo Andaluz and Turespana. Gloria Guevara, President & CEO, commented: “The WTTC Global Champions Awards are designed to recognize those countries and individuals whose policies or initiatives have made a significant contribution to the creation of jobs in our sector in a range of different ways. It appears the implementation of the National Tourism Strategy of Oman is in excellent hands. Last week Carlos Vogeler started a two-year contract with the Ministry of Tourism of Oman, where he is now leading a team that will support Minister Ahmed bin Nasser Al Mahrizi and his team on implementation. Carlos Vogeler was considered by many leaders as one of the most influential executives in the travel and tourism world when he served as the executive director of UNWTO under Secretary-General Taleb Rifai. Together with Korean Ambassador Dho Young-shim, Mr. Voegeler was a candidate for UNWTO Secretary-General in 2017. Mr. Vogeler was with the World Tourism Organization for 9 years. He was honored on November 29, 2017, at the UNWTO Conference on Jobs and Inclusive Growth in Montego Bay by the Hon. Ed Bartlett, Minister of Tourism of Jamaica. Before Mr. Carlos Vogeler joined UNWTO in 2005 he was a tenured professor at University “Rey Juan Carlos”, Madrid, at the Dpt. of Business Economics, a regular lecturer at Spanish and International Universities and author of various university textbooks, as well as numerous articles on international tourism structure. Mr. Vogeler started his career in the private sector at Pullmantur, one of the largest Spanish Tour Operators. During his sixteen years of service from 1974 to 1990, he became Deputy Managing Director and introduced many innovations, namely expanding the number of destinations and products and opening new offices and new markets. He also played an active role in the board of directors of the Spanish Travel Agencies Association of Travel Agencies and in UFTAA (United Federation of Travel Agent’s Associations), where he chaired the committee on road transportation. From 1991 to 2008 he served in various senior management positions at Group RCI, part of Wyndham Worldwide, one of the world’s largest hospitality groups, quoted in the New York Stock Exchange, where he was Managing Director for South-Western Europe, covering Spain, France, Portugal and Benelux and later Vice president of Global Account Strategy & Industry Relations. He was elected Chairman of the Affiliate Members of the World Tourism Organization (UNWTO) from 2005 to 2008, representing Group RCI. Since 1997 he had been serving as Vice President of the board of the Affiliate Members and Chairman of the Business Council and member of the UNWTO Strategic Group. He is also a founding member of the Spanish Association of Experts in Tourism (AECIT) and was a member of the International Association of Experts in Tourism (AIEST). Carried out his studies in Canada and in Spain, graduating in Tourism Business Administration by “Escuela Oficial de Turismo de Madrid” (now University Rey Juan Carlos) and post-graduate by the IESE Business School, of the University of Navarra – Spain. Mr. Vogeler was born in Venezuela of Spanish mother and Venezuelan-German father and is a national of Spain and Venezuela. Copyright © 2019 Cuba Tourism. All rights reserved. Powered by Travelindex.